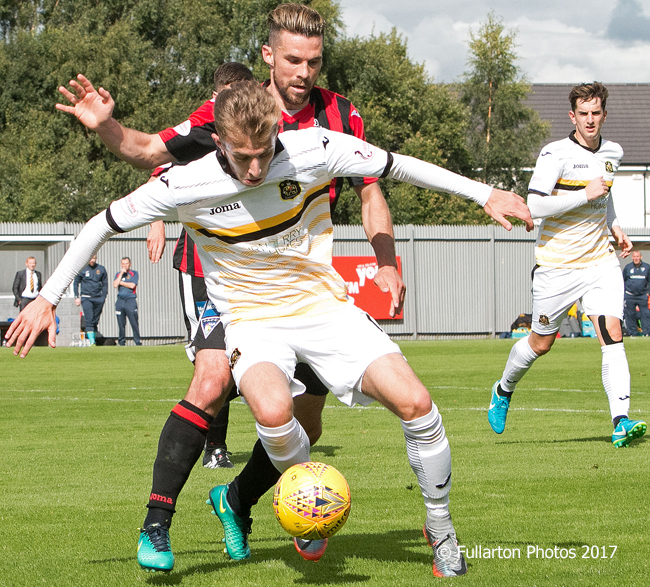 DUMBARTON were convincingly beaten at the YOUR Radio 103FM Stadium by a lively Dunfermline Athletic side who went top of the Ladbrokes Championship as a result. DUMBARTON were convincingly beaten 4-0 at the YOUR Radio 103FM Stadium by a lively Dunfermline Athletic side who went top of the Ladbrokes Championship as a result. After an early effort off the post and one off the line, Joe Cardle buried the ball into the net to give the Pars an a lead on just four minutes. That doubled to 2-0 shortly before the half hour, when Dunfermline broke from a Dumbarton corner and Kallum Higganbotham got the final touch to score. The pressure from the visitors continued until the break, and the Pars were soon in cruise control in the second half. On the hour Ally Roy (pictured) was felled in the box right in front of ref Barry Cook, but nothing was given. Twelve minutes later Craig Barr struck the woodwork with a ferocious shot. That was the closest Sons came to scoring. With 15 minutes to go Dumbarton went down to ten men when captain Andy Dowie was shown a second yellow card. Dunfermline wrapped up the match on 88 minutes, as Nicky Clark headed home at the back post for 3-0. A fourth came shortly after, when Andy Ryan put the ball home at the end of a slick move. Craig Barr, who also came close with header, was rightly named Sonstrust Man of the Match for Dumbarton, in what was otherwise a disappointing afternoon. The result leaves Sons in eighth place in the Championship, with two points from the first four games.